As a new day approaches, Fantasy and Gryffon Magesty (yes that's how she spelled her name) were doing their usual shopping in Neopia Central, the capitol city of Neopia, and getting books from the book store thanks to Trudy's Surprise Gift that day. It was a long day and they were exhausted when they got home and they had already played enough games to get the remainder of Neopoints they need. Gryffon was reading a book that she bought while Fantasy was counting how much Neopoints they have. After a short while, Gryffon was done with four books that they bought and all of them vanished in puffs of yellow, green, and purple smoke, and then she was thinking about something for a very long time. When it was time for her owner to travel, she turned to her owner and said the very thing that would have them thinking and doing things differently for a long time. "Fantasy," she began, "I've been thinking about this for a long time since we've been here and I was wondering…" she hesitated. Fantasy said, "Well, I've been wondering my whole life, so just spill it." Gryffon inhaled and said, "I was wondering if we could have a new addition to our new family?" Fantasy was interested, since her own Neopet just asked this on her own, and she was about to ask her the same thing. The only thing she could do was answer in reply, "Wow. Okay. Well, it takes a whole lot of responsibility to have a sibling around, especially since you're super intelligent, you'd have to share your books with him or her." "Exactly," Gryffon replied, "I think I am ready to take on that responsibility." Fantasy nodded as she was about to head out the door, "Okay. As long as you know. Now, when I get home, we'll go to one of two places: The Pound or the Neopet Creator." When Fantasy closed the door to leave, Gryffon got a list and wrote down the possible Neopet brother or sister she wanted. The next day, they did their usual routine, going shopping for books, which is great if you could afford all 4 books at once, and going to the games room to play games and earn Neopoints. When they were done with that they decided to go to the Neopet Creator to check out the possible candidates for a new addition to their family. It was clear that Gryffon wanted a brother, but it was undecided what she wanted for a little brother. Fantasy notice Gryffon's undecisive look and gave her a tap on the shoulder, saying, "I'll tell you what, why don't we wait until we come back to find a suitable brother for you. Does that sound good?" Gryffon nodded and they decide to head back into Neopia Central. They went into the Battledome, where Neopians come to compete, and equipping battle materials to battle. Gryffon was battling the Chia Clown again, which she loses to every time she challenges him. After yet another loss to the clown, they went home and rested. Gryffon was laying down on the couch, looking at her list of all the things they need for a new sibling. She has had her mind set on this as she was reading to get her intelligence where she is, which is a super genius. The next day, they went to do their usual routine of getting Trudy's Surprise gift, shopping for books, again, and playing games for Neopoints. Gryffon still looks at her list from time to time while shopping for books and other things for her new sibling to arrive. She wanted everything to be perfect when they decide to get another sibling. Today, they went to the bank to deposit the Neopoints to the bank so that she could save money for her sibling, and she realized that she just put in all of their hard earned Neopoints into a bank to where they might take either Trudy's Surprise for the next 24 hours or play days of games. They went home to rest and collect their bidding. As time progresses on, Gryffon and Fantasy sit around thinking about what to do about housing, material, and other things to make their new sibling at home. When Trudy's Surprise came in, they took what they won, and they think about what to do with what they have. The next day, after coming back from the bank, however, EVERYTHING had been sold out. Everything, from the Food Shop, to the Book Store, to everywhere in Neopia Central and beyond were sold out of everything, and this made Gryffon extremely furious. Every store up until her favorite place, the bookshop, she screams, "Oh Come ON!! Everything's out?!" Fantasy tried to calm her Neopet down, "Calm down, Gryffon. Now why don't we go play some games until everything's in stock again. 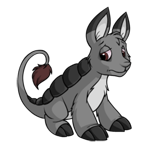 Her Neopet sighed and looked o her owner with disappointed eyes, "Alright. But they'd better be stocked when we get back! I don't plan on making my little brother uncomfortable when he enters Neopia." "I understand," Fantasy said, "Now, why don't we take all that pent-up aggression and take it to the Battledome?" They go to the battle dome to let off some steam with Punchbag Bob. After a little break from the battlefield, she still looks at her list of what she wants in a possible brother, and Fantasy smiles at her, proud that she is caring about a sibling she'll soon have. Once they were done with the battlefield, they strolled into Fairieland so that she can get a healing potion. They come back to their house to sit down and talk about it. "Now Gryffon, I understand you're stressed out about getting a new sibling," Fantasy said, "but you have to understand that we are in a place where everyone's accepted, and no one is perfect. Which means you need to stop worrying about the little things and focus on bigger things when we do get you a sibling." She puts her hand on her Neopet's paw, "Everything will have already be prepared for when he'll arrive. I promise we'll be absolutely ready to welcome him with open arms. You understand what I'm telling you." Gryffon nodded and replied, "Yes. You want me to be patient and wait for when the time comes for me to get a sibling." Fantasy patted her Neopet on the back, "That's my girl." The next day, Gryffon was playing the first level of Cheat! again when Branston the Eyrie saw her list. "Cheat!" he blurted looking at her list. She looked at Branston, saying, "I wasn't cheating, I actually did put down two fives." As Branston the Eyrie grabs his cards to add to his pile, he turns to her, "Hey, girl. I noticed that notebook filled with stuff." He then joked, "Is there a special someone 'round your table? Eh?" Gryffon was surprised that he saw her list and hid it back in her bag. "Oh naw, I was just messing with ya," Branston said when Gryffon saw her put it away, "But what was that notepad for, anyway?" Gryffon sighs and then tells them, "this is all my possible options for a sibling." Capara the Kyrii then looked up when she said that, "Get outta here? You getting a sibling? You on point fo dat." Little Timmy the Tuskaninny also looked up and said, "D'uh. Does he know how to play Cheat, too?" Capara and Branston look Little Timmy with a 'seriously?' expression on their faces, then Branston turns back to Gryffon, "Ey, siblings are a part of life. They need the most outta older people who look up to ya." Gryffon was amazed at how they knew so much about siblings, so they talked about it whie playing the card game till around noon. Then Gryffon went home to rest her eyes from yet another loss. Still, she had her li-…Uh oh! Gryffon checked her bag and her notepad was gone! "Oh No!" she exclaimed, "This is terrible! Oh, dear Fyora! This is Horrible!" Fantasy comes in saddened and said, "This came in the random events page…" She looked at the random events and saw that a ghost took her notebook straight from her bag. She cried so much, and Fantasy hugged her Neopet for comfort. The next day, Fantasy went to check on Gryffon, who sat depressed on her bed, and talked with her. "Hey Gryf," she asked, "What was on that list anyway?" Gryffon turned over to her owner and said, "It was…. I… I made a list of all the possible things I wanted in a brother." Fantasy wanted to know more, "Like?" "Well," she started, "I want a sibling that can share my love of books and battling, a sibling who is not afraid to stand up for others, someone who is kind, funny, generous, and filled with love in their heart for others." Then she rose from her bed, "I would definitely want a brother, who I can joke around with all the time, even though sometimes he'll want to pull my hair out. Someone who will join me in the Battledome for battling other opponents. I could watch him all day, and even though he'll lose some, I'll be there to cheer him up." Then she looked to the wall, "But…. Mostly I want a brother who's not going to be left behind." Fantasy was so moved by Gryffon's words, she hugged her tight, tears coming down her cheeks. Gryffon hugged her owner back as Fantasy uttered, "Now don't you worry. I will make sure your brother gets the best out of his big sis. I know he will." They let go, Fantasy in tears from her Neopet's emotion, "I raised you well. And I knew you would make this decision on your own. You are a leader, Gryffon Magesty, and you know it. When we get you a sibling, we'll make sure he is loved, like you love him." They smiled and hugged again before Fantasy went to run errands. Then Gryffon layed back down, smiling with tears of joy as she hopes for a new sibling soon. Little Grey Bori loses his owner. "Are ya done yet, Pepper?"